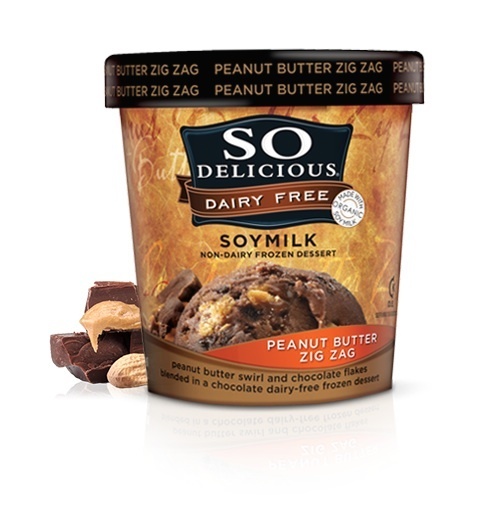 They may be free from dairy but they’re packed full of sugar, preservatives, flavors, and fillers – e.g. carrageenan which if consumed a lot, can contribute to gut health issues, as well as xanthan and guar gums. Plus, consuming too much processed soy may also interfere with our hormones. Ingredients: Water, organic soymilk (water, organic soybeans), organic dried cane syrup, peanut butter (peanuts, peanut oil, organic invert cane sugar), organic tapioca syrup, chocolate flake (cane sugar, coconut oil, cocoa processed with alkali, chocolate liquor, vanilla), organic soybean oil, chicory root extract, cocoa processed with alkali, natural flavor, carob bean gum, tapioca dextrose, guar gum, algin (kelp extract), yucca extract, gellan gum. 5 types of sugar, 5 types of gums! Despite it being gluten free, non-GMO, and vegan-friendly. Bars like this one tend to hide a sneaky secret or two – they use soy protein and puffed soy nuggets as their protein source – one of the worst quality protein you can choose. It’s extremely processed, can alter your hormone balance, and isn’t as readily absorbed in the body compared to other protein sources. Not to mention the bulking agents e.g. chicory root, and artificial sweeteners used! This NuGo Bar contains:Dark Chocolate (unsweetened chocolate, cane sugar, cocoa butter), Non-GMO Soy Crisp (non-GMO soy protein isolate, tapioca starch, non-GMO soy lecithin and salt), Chocolate Rice Crisp (rice flour, cane sugar, alkalized cocoa, salt, soy lecithin, cocoa, soybean oil), Tapioca Syrup, Agave Syrup, Rice Bran, Soy Lecithin, Gum Acacia, Natural Flavor. That’s 4 lots of sugar and a gum holding those puffed soy crisps together! They seem like a great idea, with nourishing oats, fruit, and nuts in most of them. But it’s what they add to this mix that makes them more like a candy bar! Despite the superfood add-ins, and the claims of natural and organic, be warned – many have the same calories, fat, and sugar in every bite as your favorite candy bar. The only difference? You may get a little more fiber, and a few more vitamins and minerals. 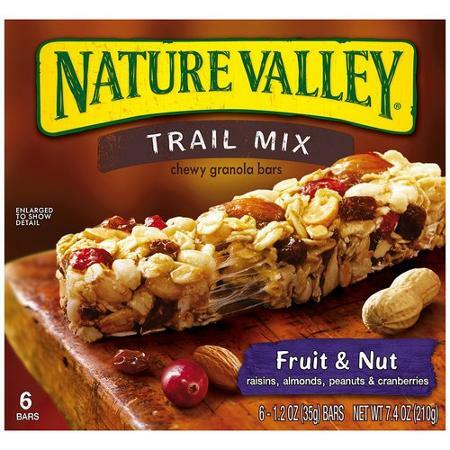 Nature Valley’s Chewy Fruit and Nut bar contains:Whole-grain oats, corn syrup, almonds, raisins, sugar, roasted peanuts, rice flour, vegetable glycerin, cranberries, canola oil, fructose, corn starch, soy lecithin, salt, barley malt extract, baking soda, natural flavor, mixed tocopherols. That’s a whole lot of unnecessary ingredients just to enjoy the benefits of fruits, nuts, and oats! A cool smoothie post-workout or on the run can be a great addition to your diet if it contains the right blend of ingredients. 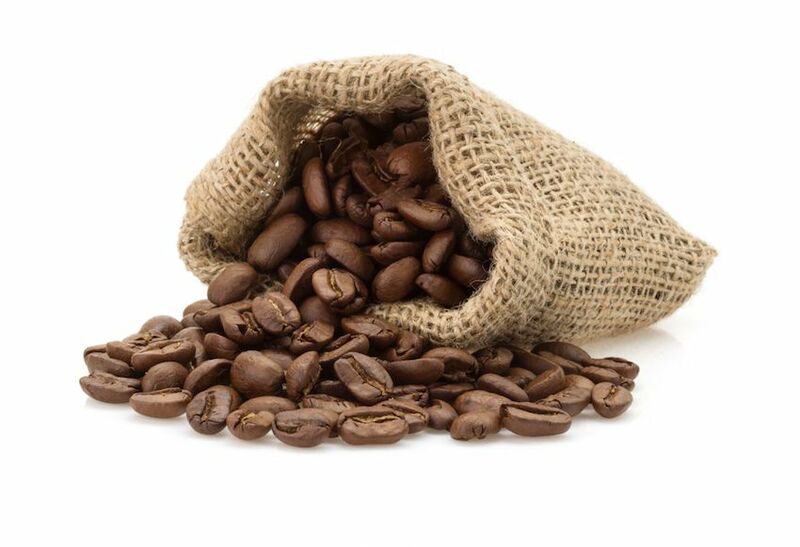 Many varieties do contain a healthy dose of vitamins, minerals, antioxidants and have nothing artificial. But, be aware, some smoothies, especially those with chocolate or added sugar, are not much more than your average milkshake. 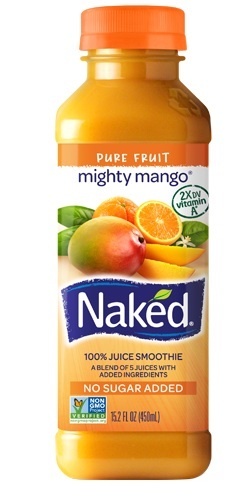 This Naked Mighty Mango Smoothie contains mango puree, apple juice, orange juice, banana puree, lemon juice, natural flavors, beta carotene (vitamin A). It doesn’t seem too bad, except for one thing – it’s all fruit. Just one bottle contains 57g of sugar – that’s a massive 14 ¼ teaspoons of sugar, in one drink, and way beyond the World Health Organisation’s latest recommended limit of 25g a day! Your better options? Choose a smoothie that contains, at least, 5g of protein to help you stay full, a little healthy fat e.g. avocado, flax, chia seeds or nut milk for filling power and to absorb more fat-soluble vitamins from the other ingredients, and plenty of greens/vegetables! Baked or deep-fried veggie chips are not healthy alternatives to fresh produce, and they’re not much healthier to the usual potato crisps either. They’re typically highly processed and cooked in refined vegetable oil which leads to inflammation in the body, a risk factor to many chronic diseases. Despite the veggies on the packet, the ingredients list is often much sadder. 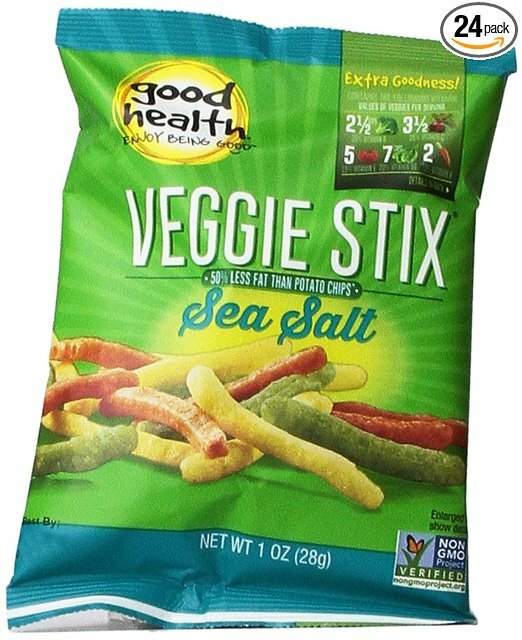 These Veggie Stix contain:Potato starch, dehydrated potato, high oleic expeller pressed sunflower oil or safflower oil, rice flour, salt, dehydrated vegetables (garlic, tomato, green pepper, parsley, spinach, celery), vegetable extracts for coloring (paprika, turmeric, radish, apple, blackcurrant), potassium chloride, nutrients from a proprietary blend of vegetables (spinach, broccoli, carrot, tomato, beet, shiitake mushroom), sea salt. As you can see, the only vegetables in there are dehydrated and extracts – not exactly your powerhouse nutrient source like the original fresh produce they started out as! In fact, many of these products are simply potato chips with veggie powder sprinkled into the mix. When you’re after a healthy snack and a cookie craving hit you, you would think a gluten-free, natural cookie from the health section would be a decent alternative. But, unfortunately, it’s not as black and white. Many gluten-free cookies contain highly refined flours, starches, gums and sugars to create that crunch and flavor similar to a regular cookie. If you’re going to eat a gluten-free cooking, choose one with minimal ingredients and opt for those made on nutritious gluten-free grains – gluten free oats, quinoa, amaranth, brown rice, millet etc for extra protein and satisfying fiber. Udi’s cookies above contain a whole mix of ingredients that certainly aren’t healthy in our eyes. 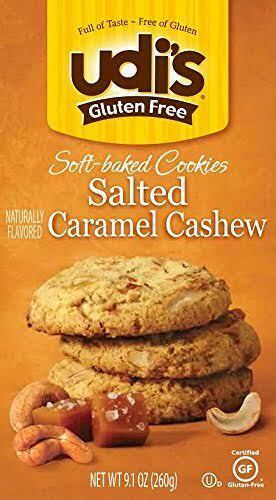 Ingredients:Tapioca starch, dried cane syrup, palm oil, brown rice flour, cashew pieces, eggs, tapioca syrup, toffee bits (rice syrup, palm oil, cane sugar, almonds, salt, agar gum, natural flavor), potato starch, molasses, salt, natural flavors, vanilla extract, xanthan gum, baking soda, caramel color. 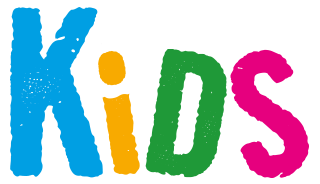 5 sugars, 2 gums, added colors and flavors, as well as palm oil! No, thank you. Whilst raw food style snack bars make a nice quick snack on the go, not all of them are 100% raw, adding extra sugar to an already high sugar snack thanks to the dried fruit base. If you’re going to have one, skip the extra large bar and keep your portion small. Some also have protein powder or a high nut content helping to reduce the sugar crash you’ll have soon after consumption. Stick to those whenever you can. 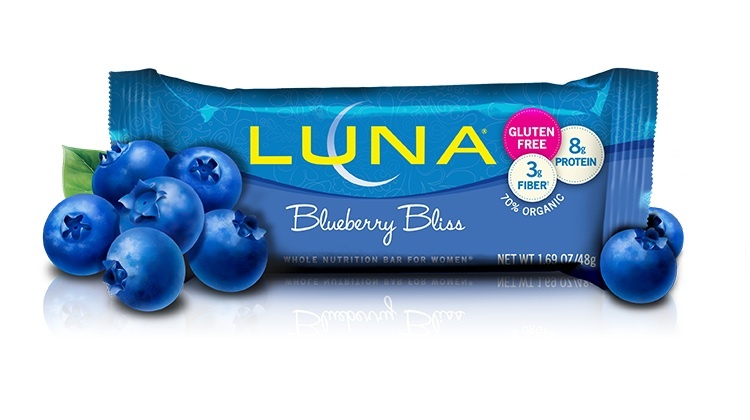 LunaPro® (Soy Rice Crisps [Soy Protein Isolate, Organic Rice Flour, Calcium Carbonate], Organic Toasted Oats [Organic Rolled Oats, Organic Dried Cane Syrup, Natural Vitamin E (Antioxidant)], Organic Soy Flour, Organic Flaxseed), Organic Brown Rice Syrup, Blueberry Fruit Topping (Organic Dried Cane Syrup, Inulin[Chicory Extract], Organic Brown Rice Syrup, Organic Apple Powder, Vegetable Glycerin, Organic Blueberry Juice Concentrate, Organic Corn Starch, Water, Organic Palm Kernel Solids, Organic Tapioca Maltodextrin, Citric Acid, Natural Flavor, Pectin, Organic Soy Lecithin, Red Cabbage Extract [for Color]), Coating (Organic Dried Cane Syrup, Palm Kernel Oil, Organic Palm Kernel Solids, Organic Soy Flour, Organic Soy Lecithin, Organic Vanilla Extract), Inulin (Chicory Extract), Organic Soy Butter (Organic Roasted Soybeans, Organic Soybean Oil, Salt), Organic Almonds, Organic Tapioca Syrup Solids, Dried Blueberries (Blueberries, Apple Juice Concentrate), Vegetable Glycerin, Organic Sunflower Oil, Natural Flavors, Sea Salt, Citric Acid, Natural Vitamin E (Antioxidant). Plus 24 different synthetic vitamins and minerals on top of that! We’re exhausted just looking at that complicated list!